The angled cheeks of the Victorian and Edwardian register grate were invented by Count Benjamin Rumford, an American inventor. The Rumford grate was much more efficient in the way it deflected heat into the room. 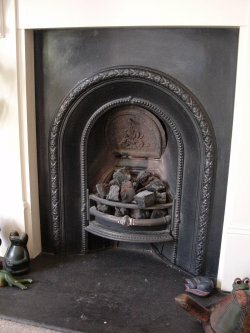 The cast iron register grate was common from the 1850s; it was cast as one piece incorporating the grate, fireback, an inner frame and a moveable plate in the flue to adjust the draught. The early designs generally had a round top before the square top took over. 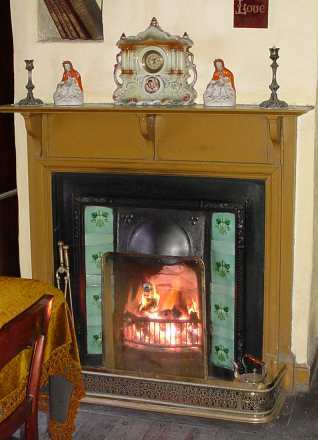 In the 1860s, Gothic styles brought the open fireplace back into fashion. With the Queen Anne style, hob grates also reappeared, despite their inefficiency. 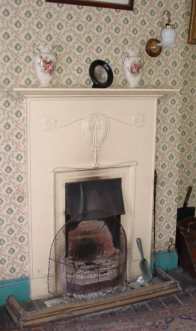 Fireplaces continued to show a wide range of styles - designs from before 1850 were still available to 1900, as well as new Art Nouveau patterns. Often a pattern was available in three or four sizes, and sometimes in as many as ten. Tiled 'cheeks' were the height of fashion between 1880 and 1900. 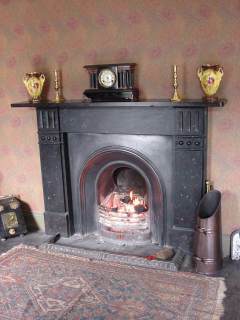 Most rooms had a fireplace, though those in the bedrooms were rarely used. The grate was polished to a dull sheen using black lead. This was applied very sparingly and then polished vigorously. An alternative was a thin coat of matt black paint, a coating of wax, and then polished. For companies selling fireplaces and ranges, see the Products and Services Directory.